There is no doubt technology – e-commerce platforms, social media and the ability to track customer behaviour – has made luxury sales to global customers easier and more efficient. Once considered by the luxury industry as a platform on which to sell only lower-end goods, e-commerce has proven itself to be a trusted platform on which to buy high-priced items. As Toby Bateman, MD of online retailer Mr Porter, stated earlier this year: ‘8 years ago, [luxury menswear brands] thought there was no way anybody would spend more than £1,000 online for an item of clothing’. Mr Porter currently lists a £355,000 tourbillon sapphire crystal watch from Bell & Ross. And research has shown that luxury online sales continue to grow exponentially: in 2016, 8 per cent of European luxury goods were sold online whereas in 2018, the figure had increased to 19 per cent. According to a December 2016 report from Euromonitor, global digital luxury sales will increase at a compound annual growth rate (CAGR) of 8 per cent during 2016–2021 vs. 2 per cent for in-store. Nearly 80 per cent of luxury shopping is ‘digitally influenced’, be it via marketing, bloggers, reviews or social media (McKinsey 2018). While luxury brands are now in a race to gain online customers, the misconception that customer service in the digital realm is less important than service in face-to-face sales still exists. This could hardly be further from the truth. While, just as with a successful Brexit plan, frictionless trade is key for successful online sales, it is also true that customer service is just as – if not more important, at times – than a quality product to promote client loyalty. This means not just knowing your customer in order to sell them more, but having an expert team of customer service representatives available to answer calls when things online go off-piste. Regarding the former, digital marketing and data capture now allow companies to go beyond the typical customer segmentation allowing brands to create a more personalised experience for each of their customers. Even Amazon.com can advise on what it thinks you might want before you know you want it. Regarding the latter, every customer touchpoint is an extension of the brand – from the automated emails thanking the customer for his or her purchase to the returns process, giving companies the opportunity to command loyalty through excellent service. And luxury customers expect luxury service, whether online or in store. Did something go terribly wrong with an order? Did a customer just purchase a £355,000 watch online? If so, would a personal note or phone call be better placed than an automated email? Just because the transaction took place online doesn’t mean the customer service also needs to remain online. In-store, should there be any difference to how one treats online customers vs. regular bricks-and-mortar shoppers? And could staff tell those who prefer e-tail apart from those who prefer retail? Don’t assume it’s aged-based. According to McKinsey, the ‘Baby Boomer’ generation spends 16.4 hours per week on the Internet, vs. 17.5 logged by millennials, and 75 per cent of Boomers use social media, compared with 98 per cent of millennials (2018). A report by Google on how shoppers use digital media to research and buy luxury products showed the average age of a luxury shopper in the US, UK and Europe to be 46 and 75 per cent of all luxury shoppers in new and mature markets used the internet more than any other media in their purchase decisions. Whether online or in store, brand loyalty needs to be nurtured, and rapport and trust with clients needs to be built. 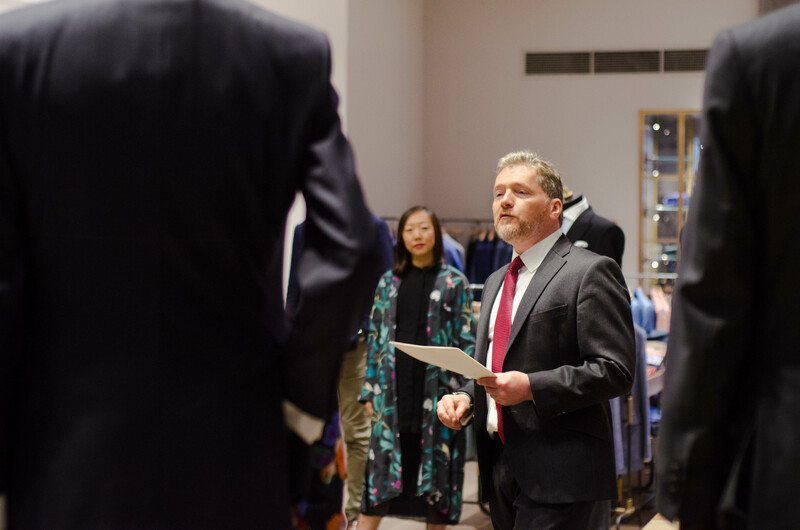 At Debrett’s, we work to help luxury retailers develop their staff to build lasting relationships has shown us the importance of balancing formality and approachability. In our British and International Business Etiquette course we teach how the choice of language and even a minimal knowledge of cultural courtesies are key requirements to successful transactions. For example, some cultures are known to be more direct than others; using straightforward language, minimising small talk and immediately addressing important issues such as availability and price will be appreciated. For other cultures, this level of directness would be considered rude. More passive language, small talk and constant reading of the customer’s body language to gauge his or her level of comfort can ensure a positive experience. The digital age has automated so many tasks which once required face-to-face interaction, meaning it is more important than ever that these few opportunities to interact in person go well. Brands must ensure their staff have the confidence and soft skills to approach and assist customers as well as diffuse difficult situations. Of course, they must also ensure their digital customers feel just as valued, with excellent, personalised customer service. This may seem like double the effort, but it’s also double the opportunity to sell luxury goods.